TAIL GATE GRAB RAIL POLISHED STAINLESS ST.
Our Tailgate Grab Rail is a stylish addition to your Rhino tilt bed. The Tailgate Grab Rail is made from strong stainless steel tubing for durability. The stainless steel grab rail comes polished for that truly custom look. Available in powder coated black too. Also pictured is the polished stainless steel bed rails PA-Y074060-SS (sold seperately). 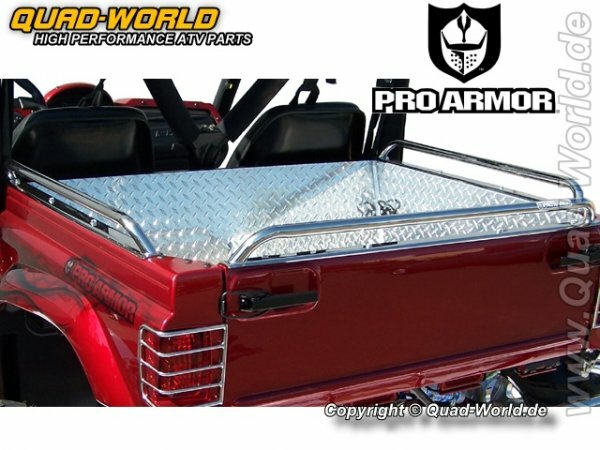 Weiterführende Links zu "Pro Armor TAIL GATE GRAB RAIL POLISHED STAINLESS ST für Yamaha Rhino für Yamaha Rhino"
Kundenbewertungen für "Pro Armor TAIL GATE GRAB RAIL POLISHED STAINLESS ST für Yamaha Rhino für Yamaha Rhino"